Thanks for stopping at my blog today, Sally! I appreciate you answering my questions! Tell us a little about yourself. You can get a good idea of who I am from my author’s bio. I’m from the Midwest but I’ve lived in Southern California for 14 years. I’m the youngest of four children. I have two black cats that are the lords and masters of the house. I’m active in my parish and for fun I attend plays at the local theater. How many cruises have you been on and what is your favorite cruise line? I’ve only been on one cruise (Carnival line) so I’m not exactly an expert on cruising! But I’d love to go on another cruise someday. I love to cruise! What is your favorite travel location? I haven’t traveled as much as I’d like. My dream vacation would be to go to England or Rome/Vatican. I’d like to tour the East Coast historical sites such as Boston and Washington DC. Those are all places on my bucket list as well! Use no more than two sentences. Why should we read your newest book? It’s a fun, humorous beach read and also tells a great story about two siblings who overcome their past animosity to work together. That’s exactly my type of book! I can’t wait to read it! How many books have you written? Tell us a little about each. I’ve written several books over the years but only three are published, the books in my Sandy Fairfax Teen Idol mystery series. Despite the name, the books are for adults, not teens. The Baffled Beatlemanic Caper: the first book in the series was a finalist for the Eureka! Award for best first mystery novel. Sandy Fairfax is a 38-year-old washed-up former teen idol. He quits drinking and sets out to make a comeback. He takes the only gig available, a guest appearance at a Beatles fan convention. When a member of the tribute band is shot, Sandy’s the number one suspect. He sets out to find the real culprit while filling the dead man’s shoes in a concert. The Sinister Sitcom Caper: Sandy’s a guest star on the lowest-rated TV show of the season, “Off Kelter.” When one of the other actors drops dead at his feet, he investigates with the help of a dwarf and an animal actor. He also deals with his ex-wife and his teenage son and meets a most fetching choreographer. The Cunning Cruise Ship Caper: Sandy asks his estranged sister, Celeste, also a musician and who is blind, to join him for a week of concerts aboard the SS Zodiac. Celeste is still angry with her brother for not helping her career years ago. But that’s the least of their problems when a dead body turns up in Sandy’s shipboard dressing room. Sandy encounters a colorful cast of suspects, while trying to avoid an old flame that is also on the ship and wooing his choreographer away from her boyfriend. Congratulations on your success with your books! When you were little, what did you want to be when you “grew up”? A writer! I’d see also the books in the city library and think, “I’d like to have a shelf full of my books too.” I also wanted to be an actress and star in my own TV show. That never happened so I had my series hero, Sandy, star in a ‘70s TV show, Buddy Brave, Boy Sleuth. It is great that one of your dreams has come true! When did you know that writing was for you? I’ve always enjoyed writing and reading stories. When I was little I’d make up stories to tell my mom while we washing the dishes. For a while I was writing plays and thought that was where I was headed but about six years ago I started writing mysteries. The fourth book in the Sandy Fairfax series will be The Bloody Black Tie Benefit Caper. Sandy’s taking part in a fundraiser to save his father’s orchestra from bankruptcy. He has to make amends and work with his brother, Warren, as well as keep his son from dropping out of school. Sandy’s also appearing on a TV game show and of course there’s a murder! I’m also kicking around ideas for a new cozy mystery series set in the 1960s. I grew up in that era but as a kid I didn’t pay attention to the news of the day. Despite all the “love, peace, peppermint and incense,” the ‘60s were turbulent times. It was the first time in America that people protested going to war instead of embracing it. Sandy Fairfax was inspired by the real-life teen idols of the 1960s and ‘70s. When I started writing the first book I read the autobiographies of Davy Jones, Micky Dolenz, Bobby Sherman, Donny Osmond and David Cassidy. I found a number of similarities in the various career paths and lives of these guys. Sandy is a bit of a mash-up of them all. You’re bringing back memories for me! What is the hardest part of writing for you? I work a day job, so it’s challenging to find the time to write. I also procrastinate at times but once I get started, the writing flows easily. I understand that! I feel the same way. What’s a good book that you’ve read recently? You won’t believe this but I just finished reading “I Was Wrong” by Jim Bakker, yes, that Jim Bakker. He explains how his PTL ministry collapsed and how his time in prison made him into a better person. It’s quite insightful and his stories about his family life are touching. It’s also highly critical of the American prison system, which at times degrades and demoralizes prisoners more than it helps them to rehabilitate. Is there any advice you would give to aspiring writers out there? Have dreams but be realistic. Writers hear tales of authors who self-published a book that became a runaway best seller. That’s not likely to happen. Most new writers will have to either publish with a small press or self-publish because agents and the big New York publishers are not interested in a writer who cannot guarantee huge sales. That’s not to sound discouraging but a writer should write for the love of it and because she wants to tell a story, not because she expects to make a killing (so to speak). It’s been years since Sandy Fairfax was a teen idol and starred in his hit ‘70s television series Buddy Brave, Boy Sleuth, but he still has his fans. Now it’s 1993 and many of his grown-up fans see a leisurely cruise as the ideal vacation. So, when Sandy’s agent finds him a pleasant gig aboard the SS Zodiac, he jumps at the chance. And, when the offer includes a spot for his musician sister, Celeste, who is blind, Sandy sees an opportunity to re-engage with his estranged sibling. However, the brother-sister duo are barely aboard the ship, when Sandy finds a singer from another shipboard show murdered in his dressing room. When the ship’s security officer does little to investigate, Sandy feels obligated to jump in, even though he isn’t a detective––he just used to play one on TV. Soon he’s grilling potential suspects, including a burnt-out piano bar player, a Southern-fried magician, a blackmail victim, a ventriloquist with a sassy dummy and even a former flame. Will Sandy unmask the killer before the cruise ends? Will he connect with the girl of his dreams? Will he have time to enjoy the sights of Nassau? Or will he end up sleeping with the fishes in the Atlantic Ocean, another victim in this killer’s CUNNING CRUISE SHIP CAPER? Sally Carpenter is native Hoosier now living in Moorpark, California. 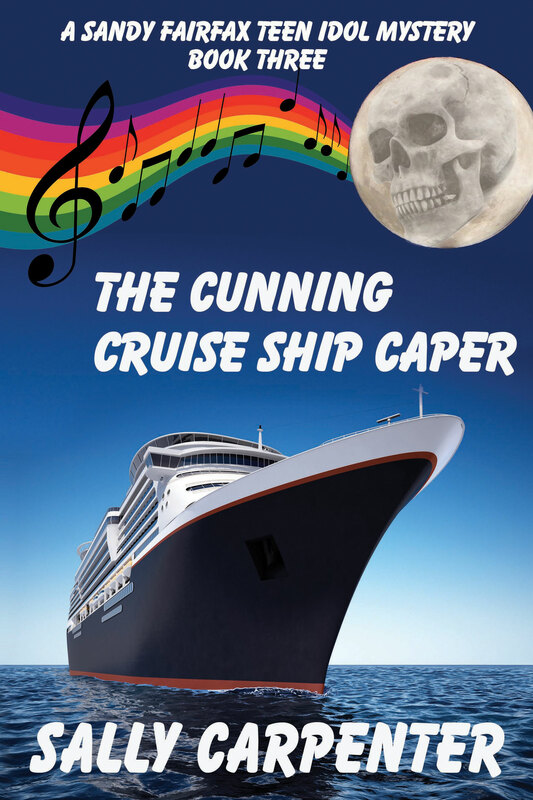 This entry was posted in Book Tour and tagged cozy mystery, Michele Lynn Seigfried, Sally Carpenter, The Cunning Cruise Ship Caper. Bookmark the permalink. ← 6 Days Left Until Community Affairs!